Do you know the way to Basquiat’s grave? This would be a good time to make a pilgrimage to Basquiat’s grave in Green-Wood Cemetery. The legendary artist, who died of an accidental drug overdose in 1988, is on New Yorkers’ minds these days. Work he painted in collaboration with Andy Warhol is on display in a blockbuster retrospective of the latter’s art at the Whitney Museum in the Meatpacking District. 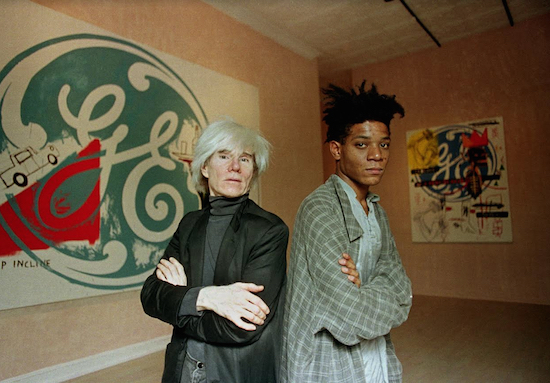 Jean-Michel Basquiat, who grew up in Boerum Hill, was the coolest of the cool kids in 1980s New York City. He was a Neo-Expressionist powerhouse. Brilliant. Beloved. Tragically addicted to heroin. Dead at age 27. Now he rests in peace beneath a plain granite headstone that says “Artist” and a blanket of autumn leaves in Brooklyn’s famous cemetery, which was established in 1838. When you head off to seek his grave marker in the hilly, 478-acre landscape, it’s helpful to have a printed map of the premises. You can pick one up at Green-Wood. If you’ve previously visited the cemetery, you probably made your entrance through the main gates on Fifth Avenue at 25th Street in Greenwood Heights. They are landmarked and Instagram-worthy. But when you’re looking for Basquiat’s grave, you’ll have an easier time of it if you start your stroll at Green-Wood’s Fort Hamilton Parkway gate. It’s open on weekends and days of remembrance such as Good Friday and Christmas. The gatehouse on Fort Hamilton Parkway is also landmarked and Instagram-worthy. On Border Avenue — which is where you’ll walk first — you’ll see angel statues all over the place. Some are on tall pedestals. Others stand at ground level on eye-catching monuments or guard the doorways of dignified mausoleums. As you proceed towards Basquiat’s grave, you turn down Grape Avenue. Where it intersects with Fir Avenue, there’s an ominous cloaked figure made of bronze. It’s Azrael, the Angel of Death. It is crouched over the grave of Charles Schieren, who was one of Brooklyn’s mayors in the 1890s while Brooklyn was an independent city. Solon Borglum is the artist who sculpted the dramatic statue. His brother, Gutzon Borglum, is the sculptor who carved the U.S. presidents’ faces on Mount Rushmore. Back in Green-Wood Cemetery, one of the most notable graves on Grape Avenue is that of actor Frank Morgan. He played the Wizard of Oz in the 1939 Judy Garland film of that name. His tombstone is inscribed with his real last name, which is Wuppermann. Next, retrace your steps on Grape Avenue to Woodlawn Path. Basquiat’s grave is located about halfway between Woodlawn Path and Mistletoe Path. When you see a cluster of tall pine trees, you’re getting close. The day of this reporter’s visit, admirers had left tokens of remembrance for the artist including a 40-ounce bottle of Colt 45 malt liquor and an artificial plant decorated with the message “Not Forgotten,” plus cigarettes, a lighter and a handwritten note. After you pay your respects to Basquiat, there are many other iconic gravesites to see — more than you can visit in a single day. Green-Wood closes at 5 p.m. this time of year. The cemetery is the final resting place for other art-world stars such as stained-glass designer Louis Comfort Tiffany and composer and conductor Leonard Bernstein. Notable political leaders, Civil War veterans and New Yorkers who died in the 9/11 attack on the World Trade Center are also buried there. One magnificent sculpture near Basquiat’s grave is a bronze angel with a swirling robe who stands atop a monument for Charles D. Valentine. He died in 1901. The sculptor, Adolfo Apolloni, later became the mayor of Rome, where there’s now a street named after him. South of the Valentine angel, there’s a stunning mausoleum William Niblo built in 1852 as a tomb for his late wife and other family members. It has a pair of eye-catching lion statues at its front entrance. Niblo frequently visited the mausoleum and held parties and picnics there. He stocked a nearby pool called Crescent Water with goldfish to entertain his guests. Niblo knew a thing or two about entertaining. He owned Niblo’s Garden, a vast Manhattan venue with an open-air saloon and an indoor theater with 3,200 seats. Niblo died in 1878. Niblo’s Garden continued to operate until 1895. Near Green-Wood’s main entrance, there’s a landmarked Gothic-style chapel designed by Warren & Wetmore that’s an architectural treasure. Warren & Wetmore also designed Grand Central Terminal. Of course, you’ll want to take photos of the cemetery’s Gothic Revival-style main gates. Distinguished architects Richard Upjohn and his son Richard Michell Upjohn designed them in the early 1860s. Today, if you look closely, you’ll see parrots nesting in the spires above the gates’ double arches. If time permits, you should climb up Battle Hill, which was a key site during the Revolutionary War. At its summit, an iconic statue of Minerva, the Roman goddess of wisdom and war, commemorates Colonial American soldiers’ valor during the Battle of Brooklyn. The bronze statue raises her hand in a salute to the Statue of Liberty in New York Harbor — a gesture that echoes Lady Liberty’s, who holds up a torch symbolizing enlightenment. As winter approaches and the days grow shorter, it’s possible to photograph Minerva at sunset and still leave Green-Wood before closing time if you don’t dawdle.